In February 1944, as Japanese forces threatened to overwhelm New Guinea, a four-pound Yorkshire Terrier was discovered hiding in the island's thick jungles. Adopted by U.S. Army Air Force Corporal William “Bill” Wynne, Smoky became a lucky charm. During her time with the squadron, Smoky saved Wynne’s life by barking a warning of an incoming shell; jumped with the unit in a specially designed parachute; and ran a cable through a seventy-foot pipe to enable the installation of critical communication lines. In addition to eight battle stars, Smoky was given the PDSA’s Certificate for Animal Bravery or Devotion in 2011. 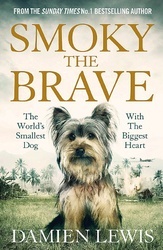 From acclaimed war dog writer Damien Lewis, here is the story of the smallest and arguably bravest dog of World War II.